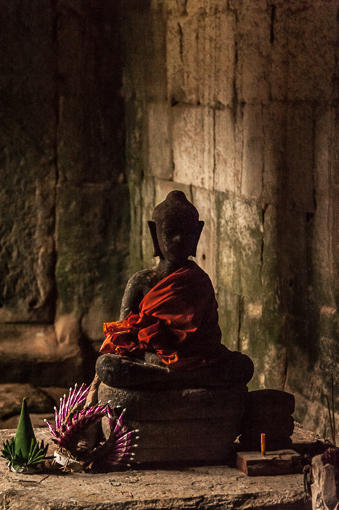 So excited this week to bring you another instalment from the time I spent last year in Cambodia. 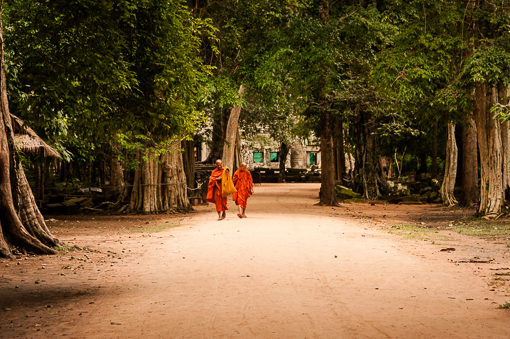 Today I will share my experience of visiting what turned out to be my favourite temple, Ta Prohm. On arriving at the “compound” you may at first feel a little deflated as all you see is a large open space and an archway – no temple in sight! 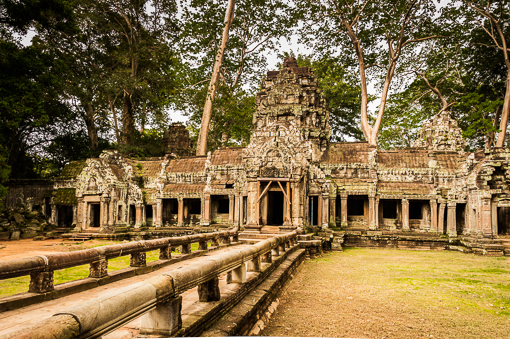 Walk through the archway and enjoy the peaceful walk down the dirt path, lined with scrub and trees, and all of a sudden the scrub opens up and you get a real ahhh moment as you first glimpse the ruins of Ta Prohm. 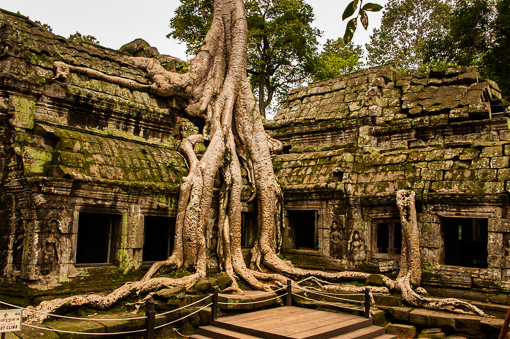 The first thing that hit me was how beautiful the combination is of nature trying to take back the temple that is Ta Prohm. 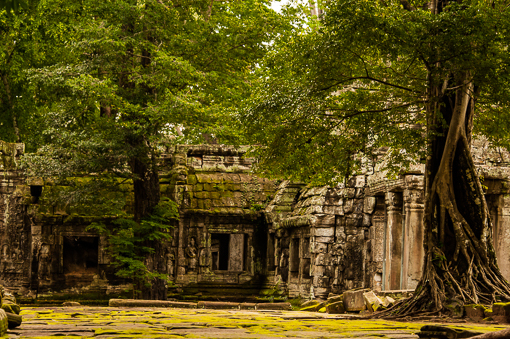 If you squat down at the entrance, before going too far, you get a real appreciation of the battle going on between the temple, Ta Prohm, and nature, there is a green “carpet” of moss that has overtaken the rock floor and the magnificent trees are growing straight out of the middle, it is truly breathtaking. 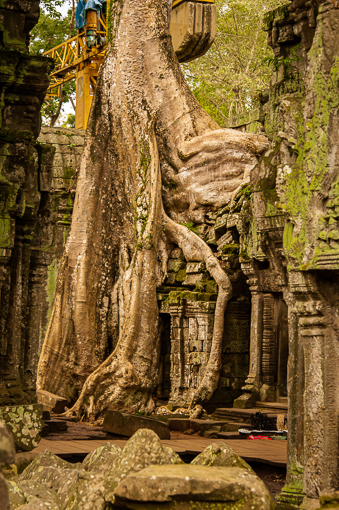 It amazed me just how the tree’s wind, entwine and climb their way through the stone and create such interesting and stunning pieces of natural art. As I walked down one of the corridors I took some time to stand still and watch the way the light was falling in different places creating such amazing patterns on the stone work. As I wandered further I came across a sculpture and offerings to the spirits, this cemented for me just where I am and how spiritual this place is. After exploring some of the many alleyways and corridors, I wound up in a large open area. Here I stood in the far back corner and waited with our guide, just long enough to capture the scene without any human elements. 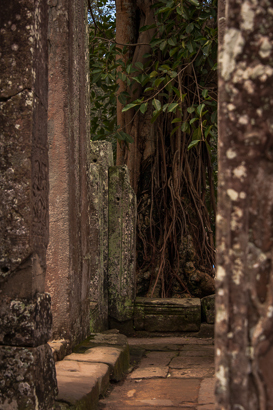 I felt a true sense of being ‘connected’ spiritually to this place and words can’t adequately describe how I was affected by Ta Prohm. 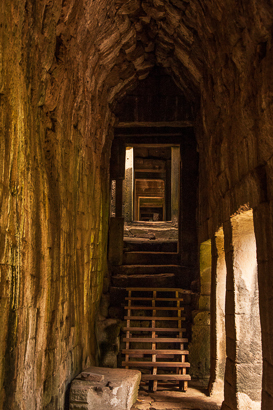 Allow yourself plenty of time to wander around the many paths and tunnels within Ta Prohm. 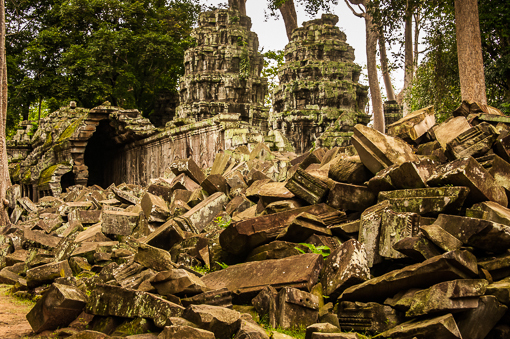 You will notice the areas of rubble that have been abandoned long ago and you will see the current extensive restoration work that is underway which will ensure Ta Prohm is restored to its magnificent “old” self. As I finish out this blog I can’t forget to mention “The Famous Tree”. The Tree which featured in the movie Tomb Raider. 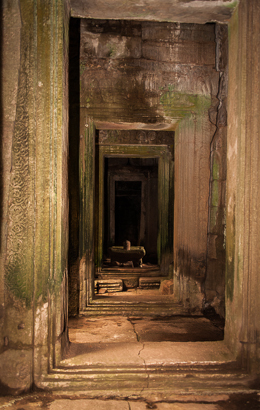 Yes, it is more stunning in real life than on film and well worth a trip to Ta Prohm, just for this purpose. I know I will be returning to it soon. Until next Friday, enjoy your week. 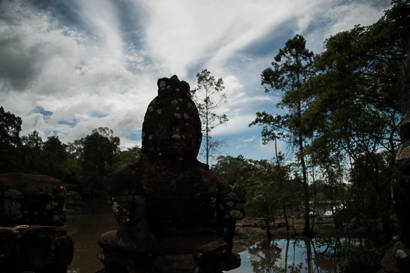 As promised here is another installment of my Cambodia adventure last year. 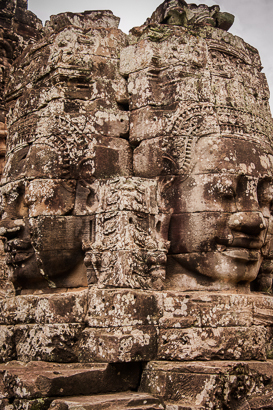 In this blog I want to share my journey about one of the extraordinary temples I visited, Bayon. My journey begins: we left the hotel shortly after breakfast and I enjoyed the morning tuk tuk ride through the city to the temples, watching as the people went about their daily duties and so many children walking, cycling and making their way to school. 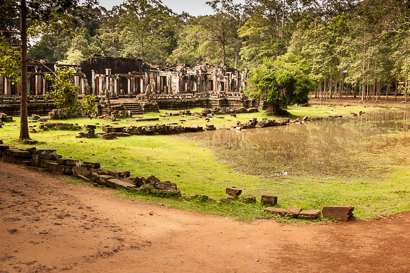 Once inside the official complex we paused near the entrance into Bayon Temple. There are a row of ‘warriors’ protecting the entrance way and many of them are still headless from the senseless looting of the precious artifacts inside the grounds. 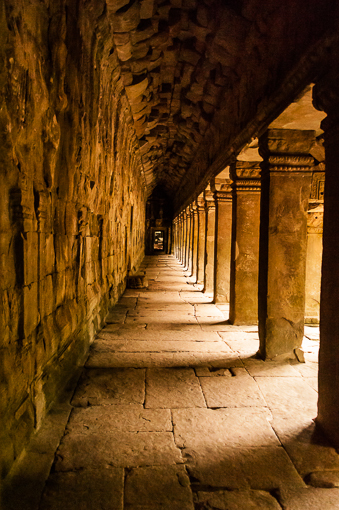 Some say the carved works are protected and I can attest to this strange phenomena. I believe the spirits and protectors were doing strange things to our camera on this day. Photos were difficult; if I tried to expose the structures correctly my images just didn’t work like they should yet if I turned my back and photographed something else my exposure was right. Was it me or a play on light or a dance with the spirits? That was my first taste of just how spiritually rich this sacred land is. Through the gate we went and again I sat back and took it all in. 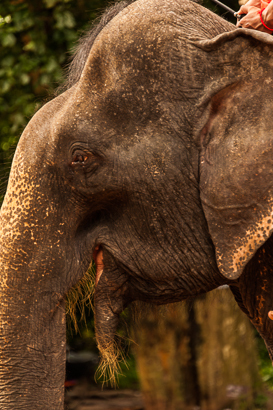 Monkeys, people, elephants, temples: a photographers smorgasbord. From a distance Bayon appeared like a pile of rubble in some areas but as we drew closer I saw the large towering smiling faces, this was simply breath taking and the need to explore grew more urgent ..
As you begin to immerse yourself in this maze-like temple you get to appreciate the many galleries and corridors, so much to take in and explore, it doesn’t matter which way you go you will eventually get to the top and that is where the magic unfolds and you see these face carvings up close and personal. As I wound my way through the corridors I found myself drawn to photographing things in frames and creating doorways with elements of the structure without meaning to – there was something that was drawing me to this. 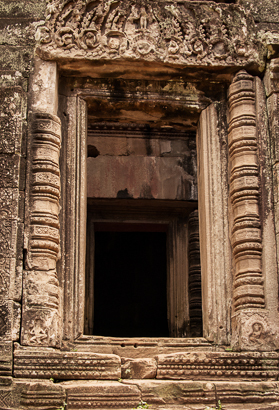 I began to see how, without thinking, I was combining the carvings with stone doors ways and windows was giving me a sense of peace and at the same time creating a beautiful photo. 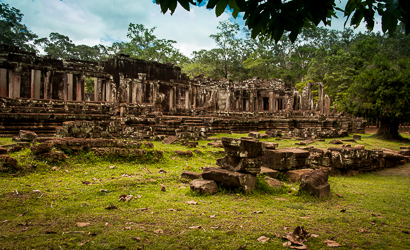 After you have wandered within the temple be sure to explore the outer walls too as the outside has a timeless beauty that I felt set it apart from some of the other temples I would later visit. I could honestly write for days about my thoughts, emotions and how I ‘found’ myself in these places but I am not sure you would still be reading. I have only touched the surface of this land, there is much more to see and explore and it is a very peaceful and spiritual place that affects me like no other. If you get the opportunity go and experience it for yourself. Until next Friday. Have a great week.